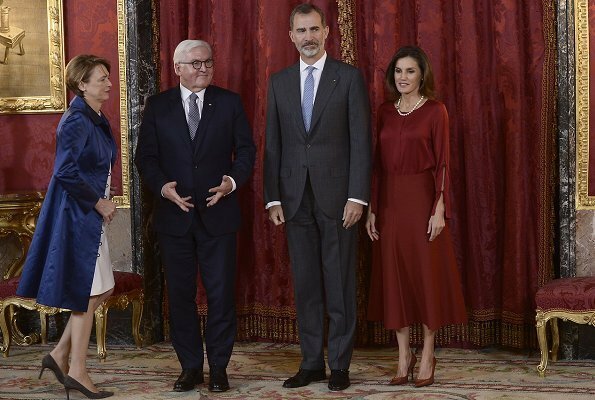 The colours of Letizia's outfit are just gorgeous. She looks great. A María no; a Mercedes. I'm in love by the pearls!!! Lleva el collar de perlas rusas perteneciente a la Reina María de las Mercedes, esposa de Alfonso XII. Letizia's hair looks very good. 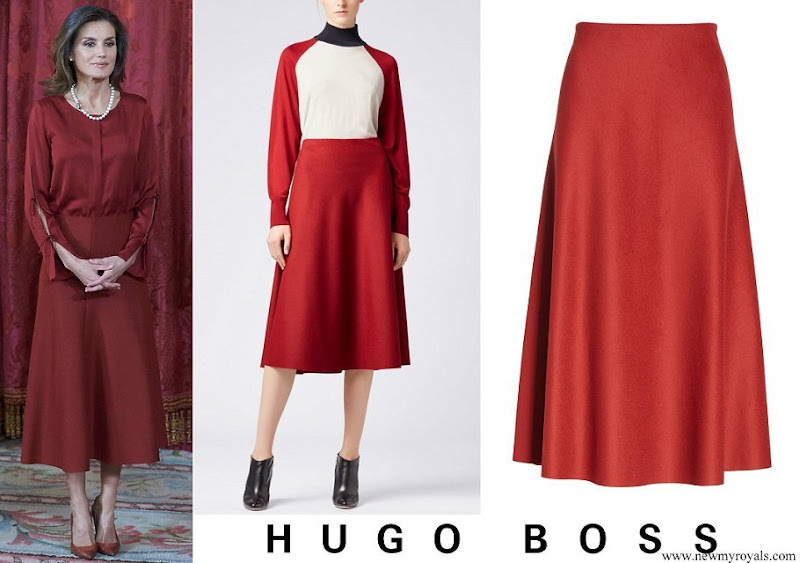 While I like this rust color on her and the blouse is pretty with unique sleeves, I wish the length of the skirt were a few inches shorter. Agree about the length of the skirt. But Letizia is a beautiful appereance anyway! LOVELY! Oh, and those pearls... Very classy. I prefer this red outfit to the one CP Victoria wore today. What a lovely outfit, the fall color looks great on her.The pearls are splendid. Welcome to Spain Mr. President. The red is her colour. 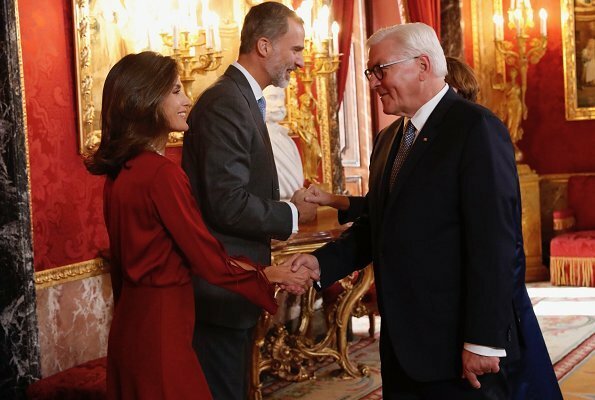 Un aspecto muy sobrio y clásico hoy de la Reina Letizia. El color granate es precioso. Con ese peinado y maquillaje suave se ve guapísima, así que vamos a ver qué operación quirúrgica se inventan hoy las de siempre. Es curioso, pero he visto otras fotos de este almuerzo en otras webs en las que los tonos de rojo de la falda y la camisa chocan. No solo no son iguales sino que "se matan". Sin embargo en estas fotos se ven perfectos! La Reina se ve magnífica. Me encanta que se ponga un collar y éste especialmente por su carácter histórico. Since both pieces are Hugo Boss, they probably match perfectly. She looks beautiful in her close up, the color of the blouse is so nice on her and the pearls and hairdo are on point. I will agree her skirt could be a bit shorter. Love Letizias outfit. Her hair is a little too "big" in my opinion. I want to mention Mrs Büdenbender. Great classical combination. She looks very good. She is 56 and looks that young and fresh. 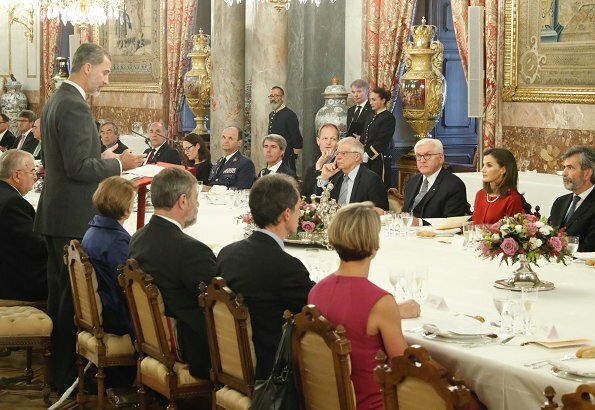 Letizia looks lovely. I am always a fan of her in red. I love the sleeve detail, and I do like the length of the skirt. She rarely gets it wrong. The pearls are stunning and are a perfect compliment to the blouse. 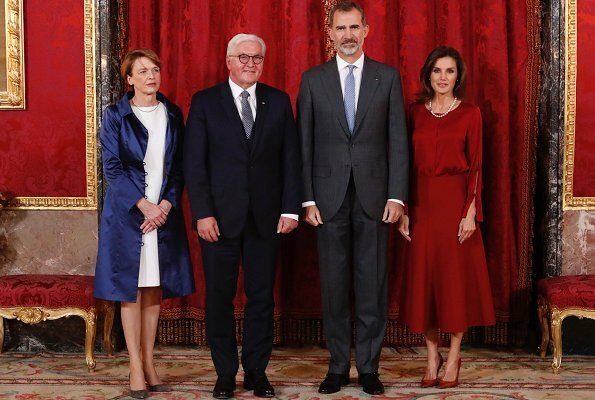 With the pearls Letizia looks old. In my opinion it's not classy anymore but out of time. Katharina, you are taking the word right out of my mouth. And I think it is quite a boring outfit, maybe it's the colour. Not the usual Queen Letizia. This time it's a 10 of 10 for judge Mrs Buedenbender. The details of this outfit are chic. However, it has been noted that she almost blends into the curtains, and those hemlines are heading towards her ankles this week. Not liking the pearls, they and the big hair have aged her. Strange choice to bring out the family heirlooms for a luncheon. Bring back the real Letizia, please. Stunning! What a winning outfit, so classic and yet with the small details that give the outfit a modern look, like the sleeves and the bicolor shoes. The hair looks so shiny and full it reminds me a little about Kate's . I take exception with the notion that pearls make you look old? IMO they are the never fail piece of jewelry, nowadays they can be worn with casual clothing or very formal attire, it's called fashion. 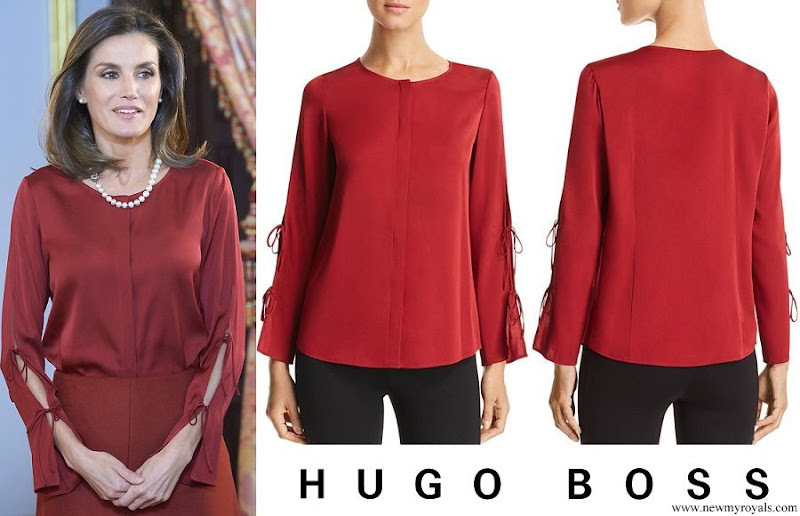 Letizia looks very good. Red is always so becoming color to her. Also nice make-up and hair. This "adult" look she has had lately looks good.